Delightfully Seasoned Beef Taco Pie with Pepper Jack Cheese ~ My Happy Pie! Packed with flavor, this family-pleasing dish is easy to make; but definitely not mundane! I love the delightful and surprising bite of cinnamon along with the beef. The pepper jack cheese and the chili powder offer just the right amount of heat, and the cheese adds just enough salt...no need for additional salt and pepper. 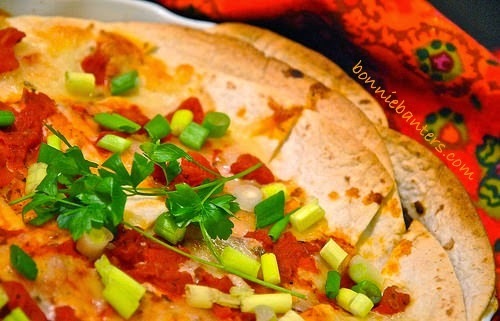 Though the pepper jack cheese does not offer over-powering heat to this delicious taco pie, you can substitute Cheddar cheese for those with more sensitive palates. For a little additional flavor, I chose to use canned diced tomatoes with basil, garlic and oregano. This scrumptious casserole makes a wonderful weeknight meal or take-along dish, and it freezes well. 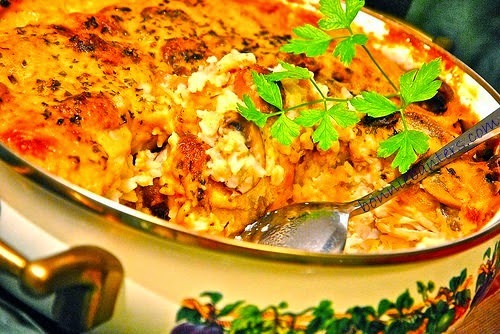 A fun and comforting pie, it makes me so happy...I just can't seem to get enough of it! Your family will beat a path home for this tender, fall-apart chicken casserole! Inspired by one of my favorite retro cookbooks, it's one of those dishes my family always loved...I need to visit those cookbooks more often. Not only is this satisfying casserole perfect for weeknight meals, the uncomplicated homemade sauce qualifies it as an excellent dish for impressive, cozy entertaining. In addition, you'll find it makes a wonderful take-along dish that's sure to please all. If you have a heavy schedule (as most of us do), this flavorful casserole is ideal for preparing ahead and freezing.